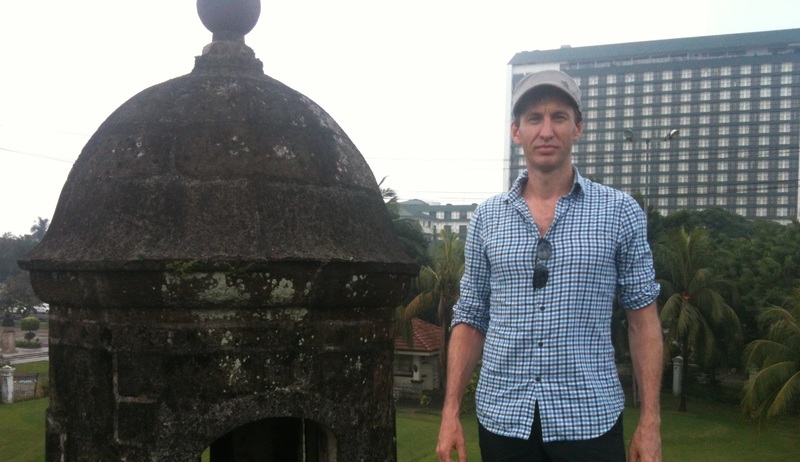 After my relaxing time in Boracay, I had a day to look around Manila on my way back to Canada. I flew from Boracay back to Manila. The airport at Boracay has a dedicated lounge for Breastfeeding. It wouldn’t do to have all that occurring in public where they could be seen by small children now would it? 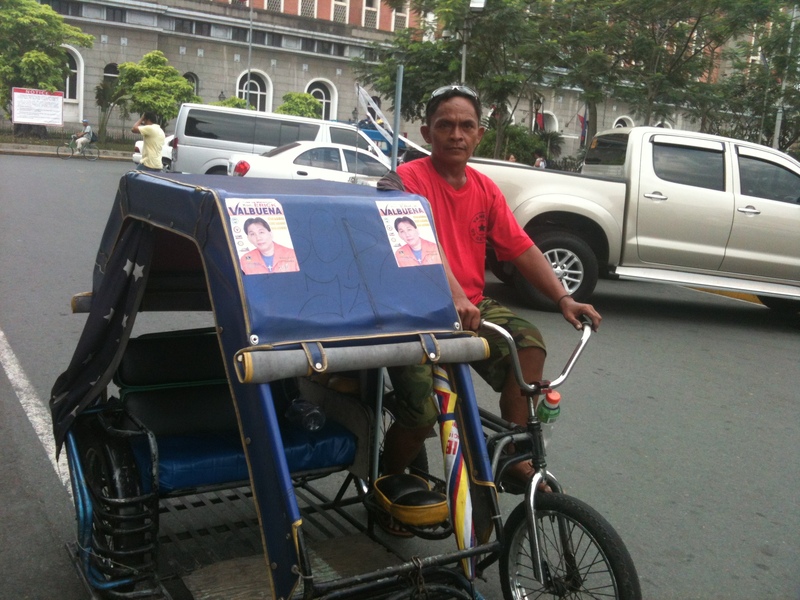 The Philippines is more conservative than I would have expected. The strong influence of the Catholic Church seems to be a factor. As I waited for my flight I heard my name called over the PA system and I had that sinking feeling in my stomach. But they didn’t bump me off the flight; they merely reseated me “for weight distribution purposes”. I’m not sure that it’s flattering news but, I didn’t mind so long as I still had a seat. Bizarrely, the flight left 25 minutes early. I asked about it and the crew explained that once all the passengers were checked in, they decided to leave. That was fine by me. 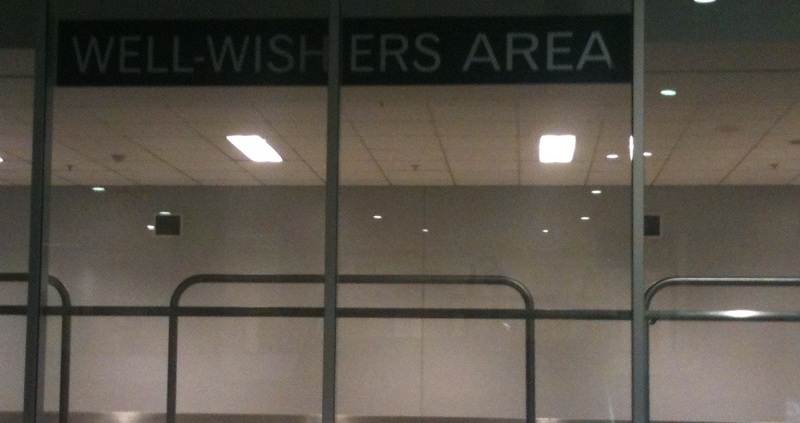 I arrived that much earlier instead of wasting more time in the departure area. 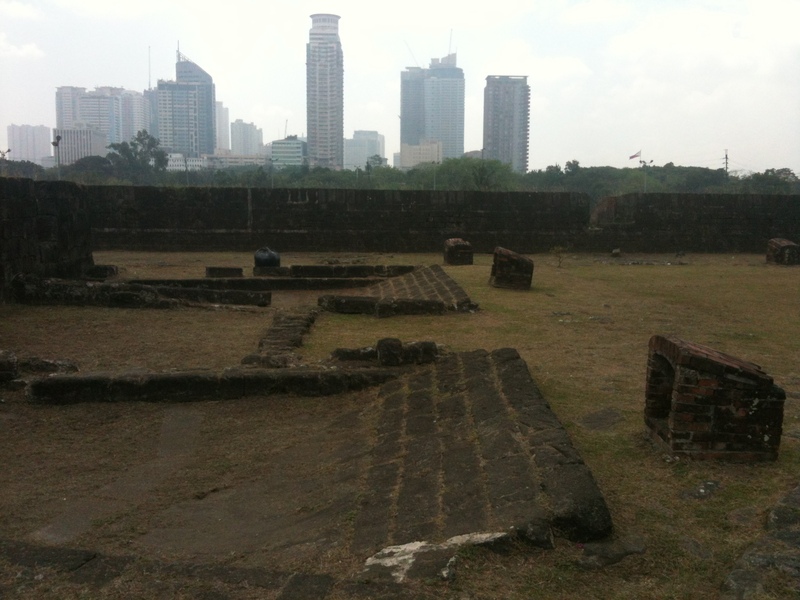 When I arrived in Manila, I looked into what my sightseeing options were and I decided to visit some historical sites. 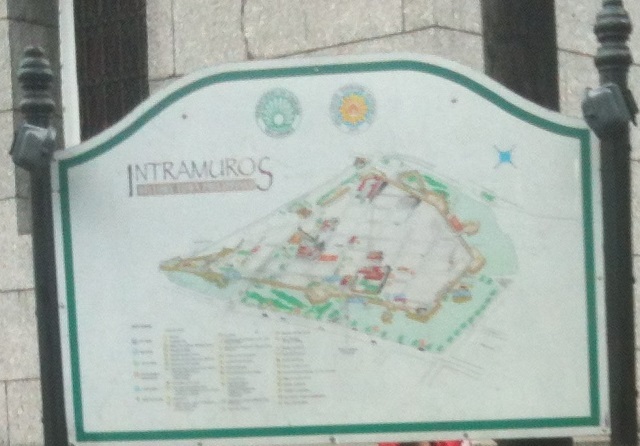 I caught a taxi from the airport and I told the taxi wrangler that I wanted to go to Intramuros Fort (a 16th century fort built by the Spanish). He wrote the destination on a piece of paper and gave it to the driver and off we went. 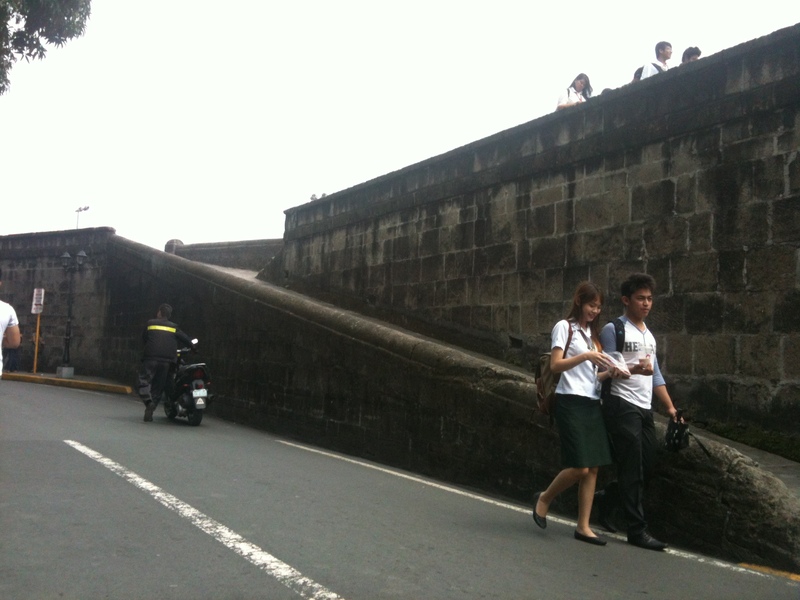 The driver asked, and I confirmed the destination was Intramuros Fort. 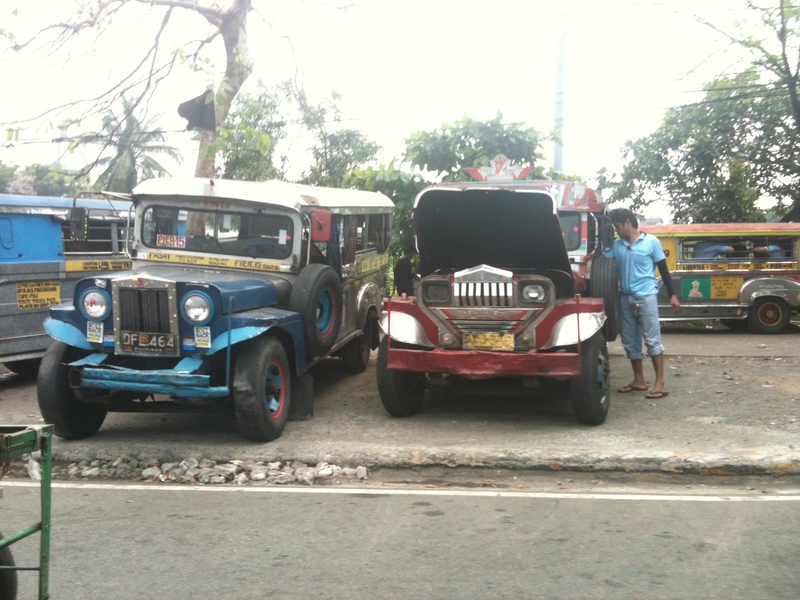 We drove for about half an hour and finally, the driver informed me that we had arrived. 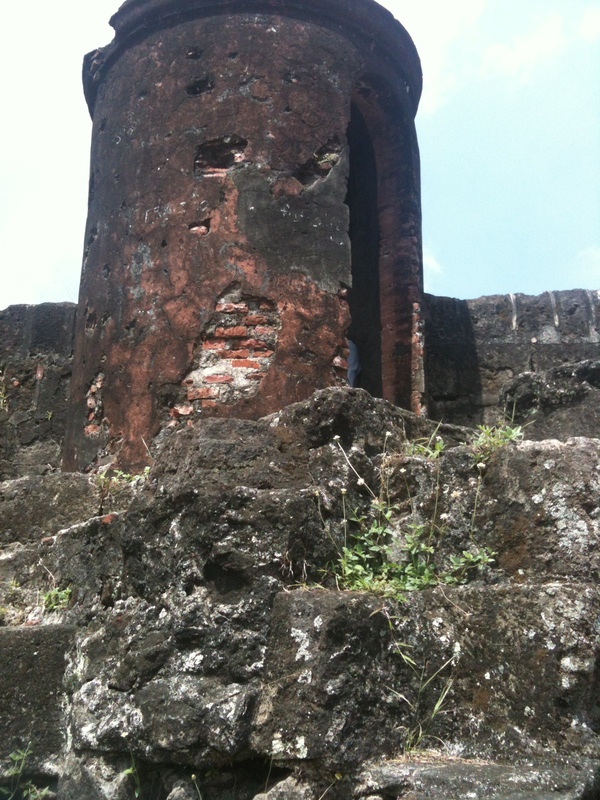 I looked around and I couldn’t see the Fort so I checked, “The Fort is just up there is it?” (pointing). Again, “Yes”, was all he said. “Oh, OK”, I answered, surprised. I looked around and I could see boats and shipping containers and cranes, but no fort. 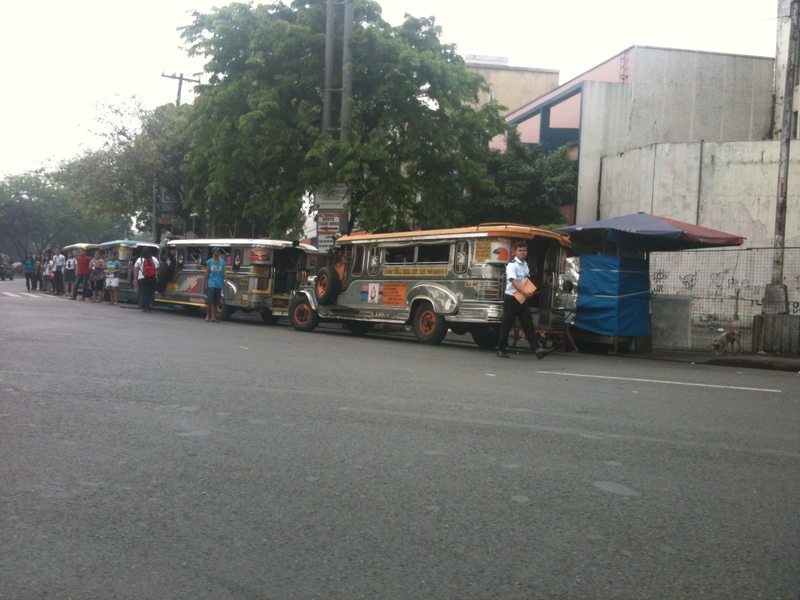 I tried to catch the cab before he took off, but he was already well up the street. I was feeling a little frustrated at this point because I think it’s fairly clear that I do not look like a crane operator or a stevedore. 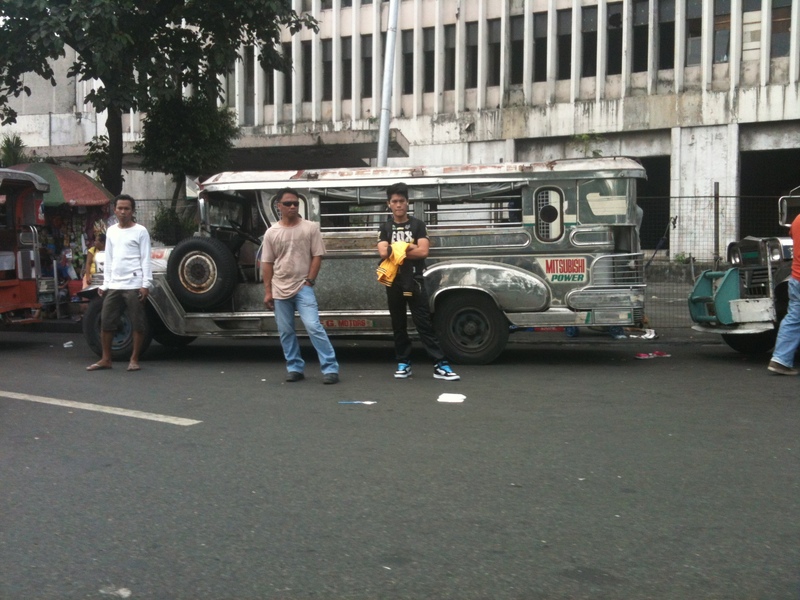 I guess the taxi driver figured that if the crazy tourist wanted to go to the Port, then he was happy to oblige. 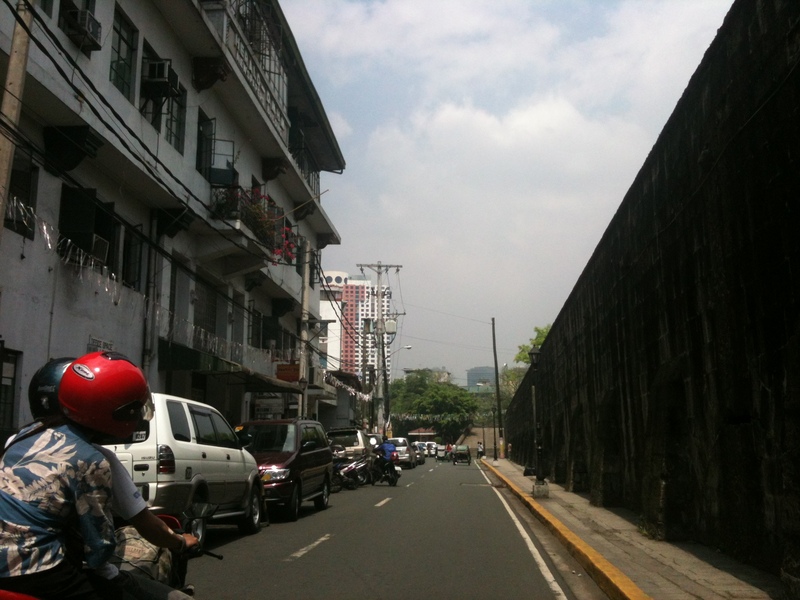 I asked a nearby policeman where the Fort was and fortunately, it was not too far away. He arranged for a sidecar bicycle taxi to take me there. 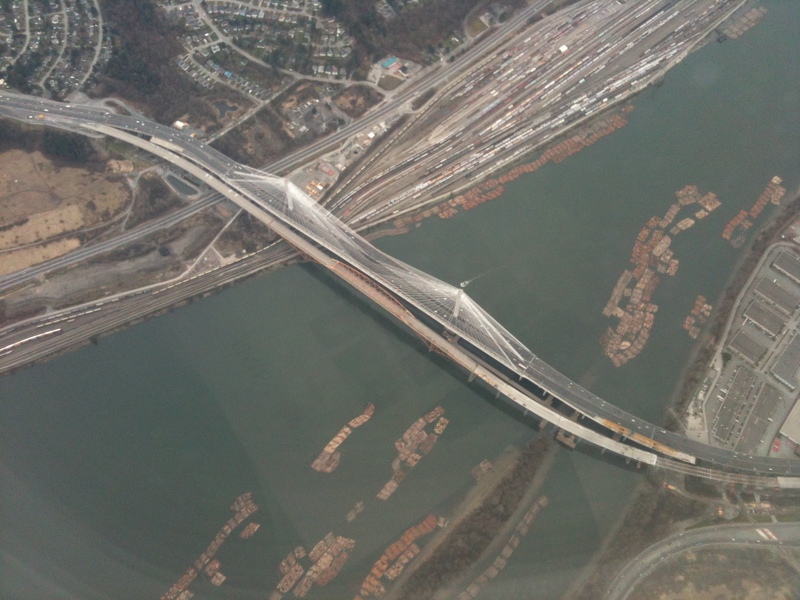 I found the initial bicycle trip terrifying – being so close to the ground and weaving in and out of traffic left me feeling more than a little vulnerable. However, I survived and after arriving at the wall I decide to engage the services of a bicycle tour guide. He took me around the various points of interest in the area. 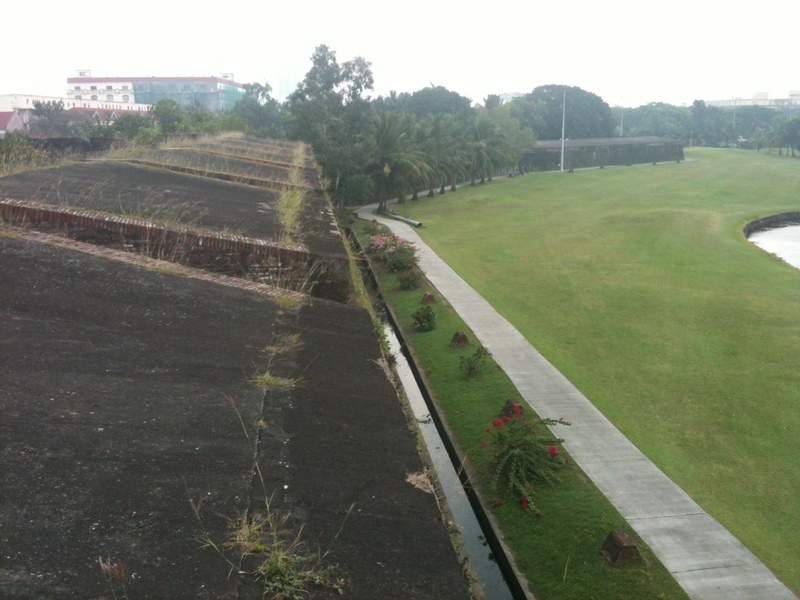 The wall is now surrounded by other buildings, many of which are built on reclaimed land. 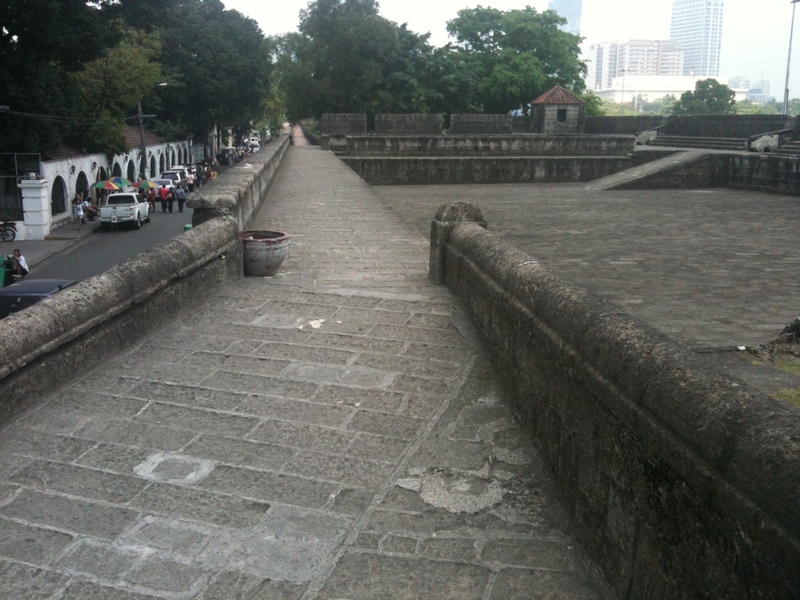 The city wall encompassed a large section of Manila and included multiple forts for the defence of the city. 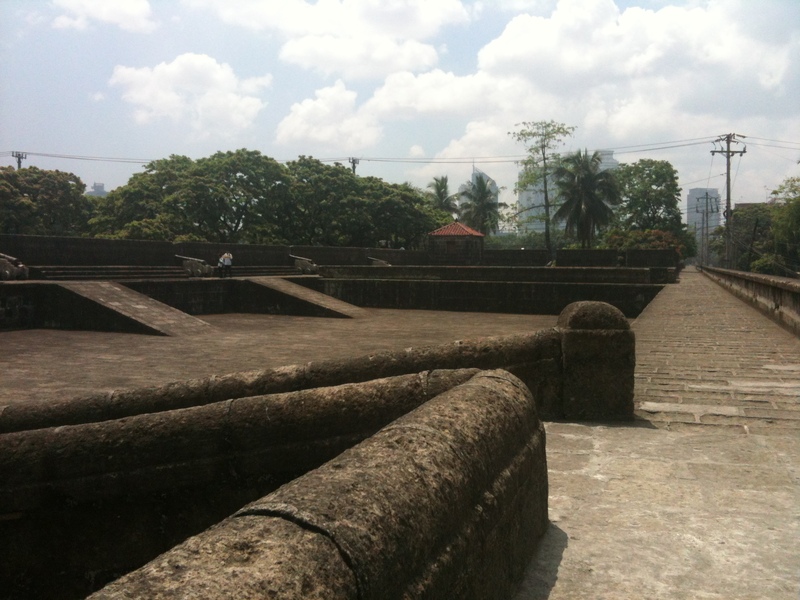 The oldest and most impressive of the forts along the wall is the Baluarte de San Diego. 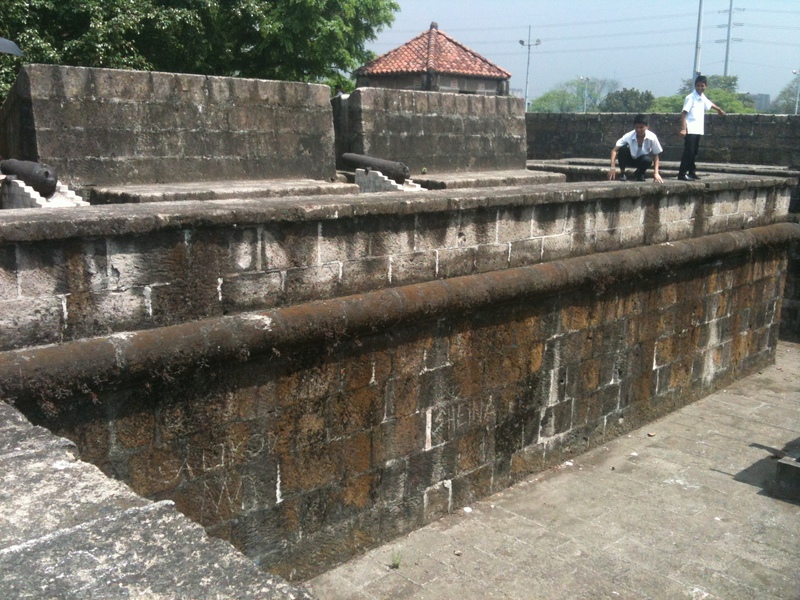 The fort was built by the Spanish in 1586 and has a long history. 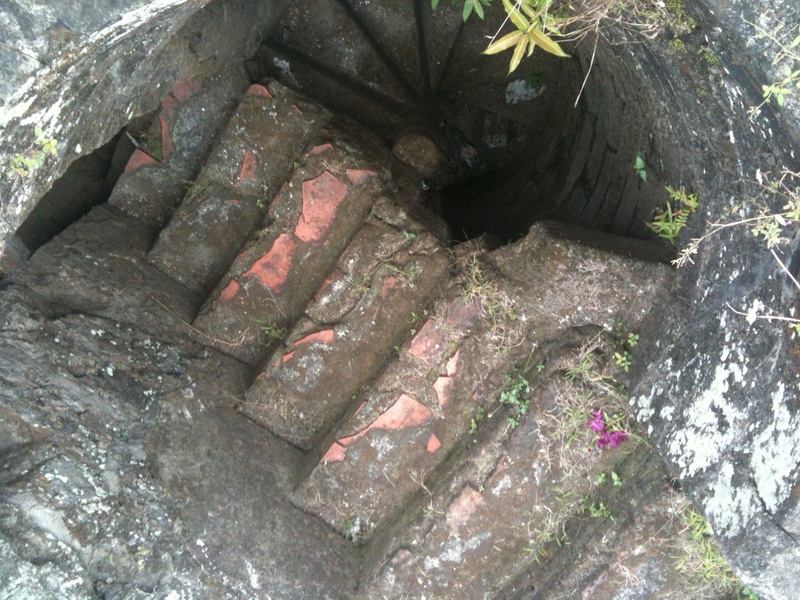 It was repaired and renovated at various times during its working life. It was badly damaged in the British invasion of 1762, but was rebuilt in 1764. The site was used by the American Army Ordinance Section during what is described as the “American Occupation”. 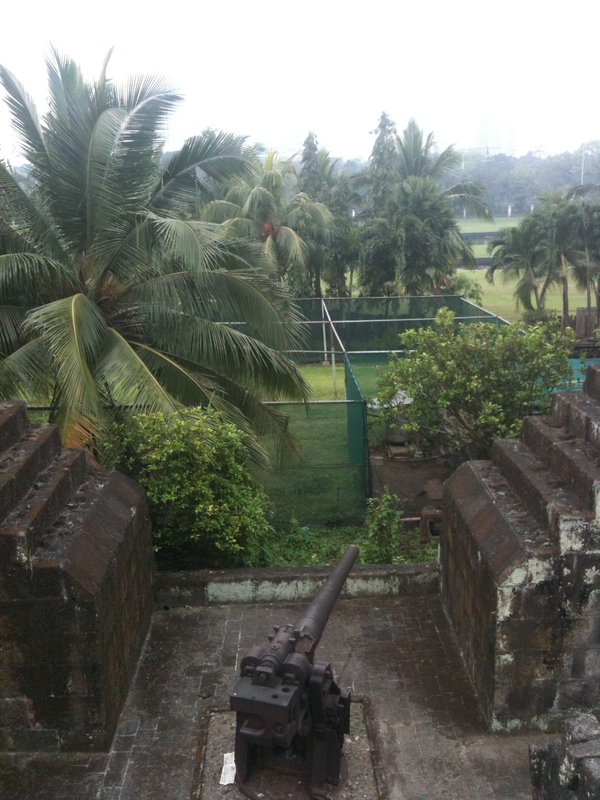 During World War II, the Americans were forced to withdraw and the Philippines fell to the Japanese who then occupied this fort. 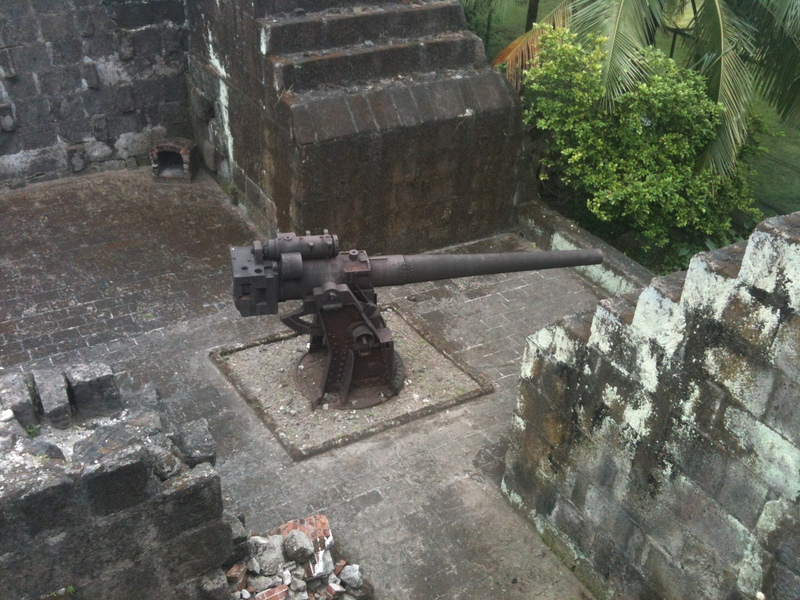 The Japanese troops were known for their brutality and it is believed that 100,000 Filipinos were killed by the Japanese on this site. They are buried nearby in a mass grave. 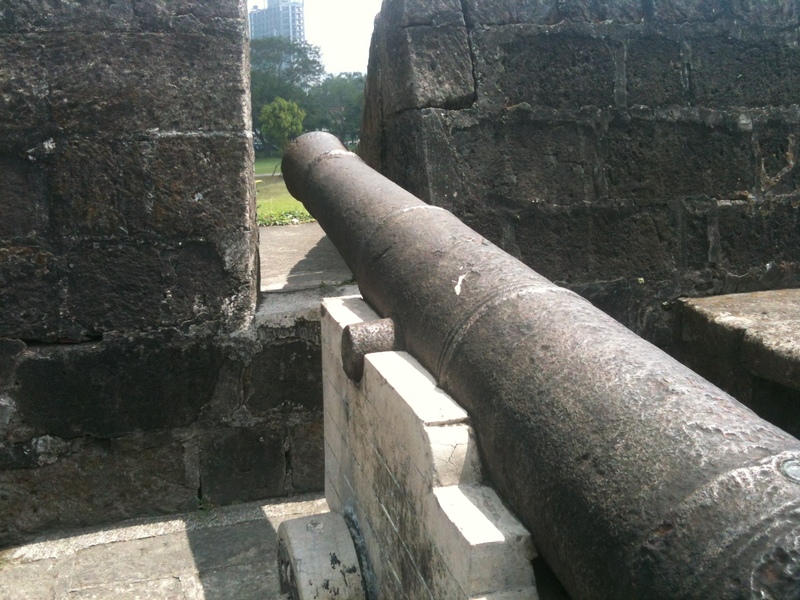 This Japanese coastal defence gun points out over reclaimed land that was open sea at the time of the occupation. 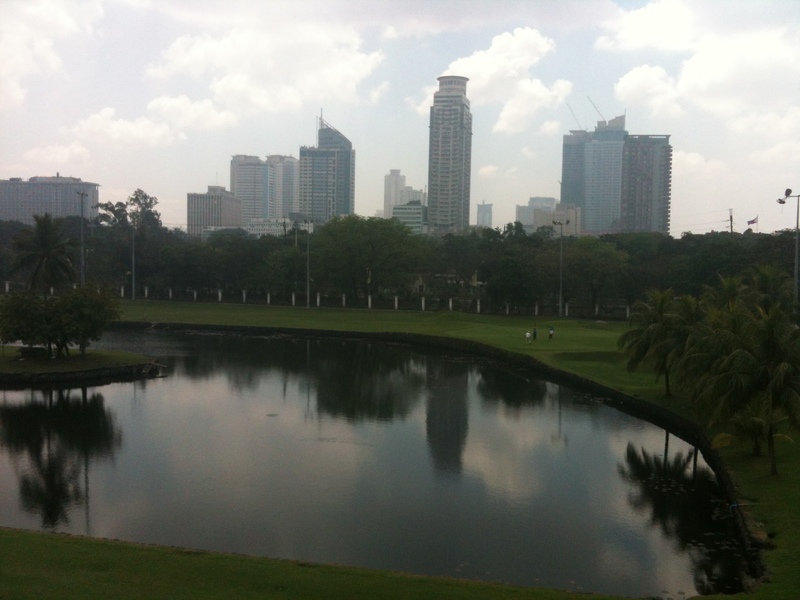 Part of the surrounding area is now a golf course. 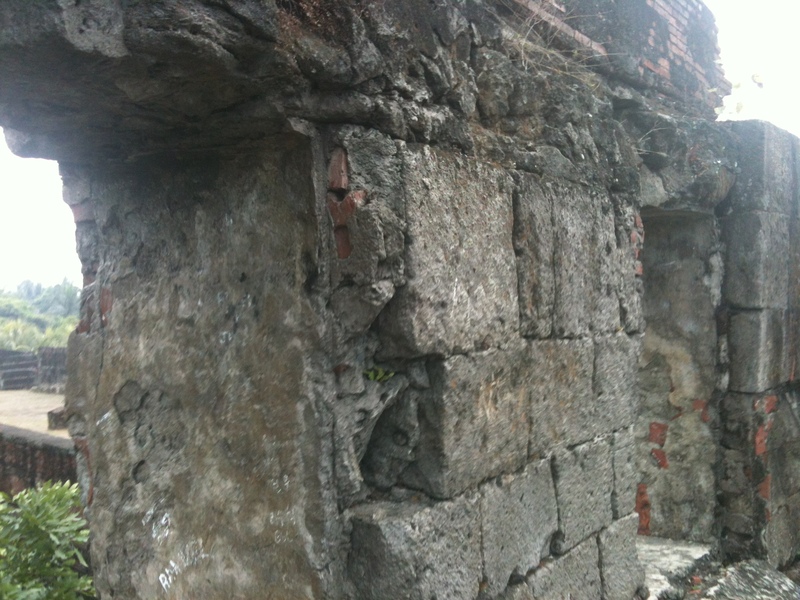 The fort was again damaged in 1945 in the Battle of Manila, when allied forces ousted the Japanese. 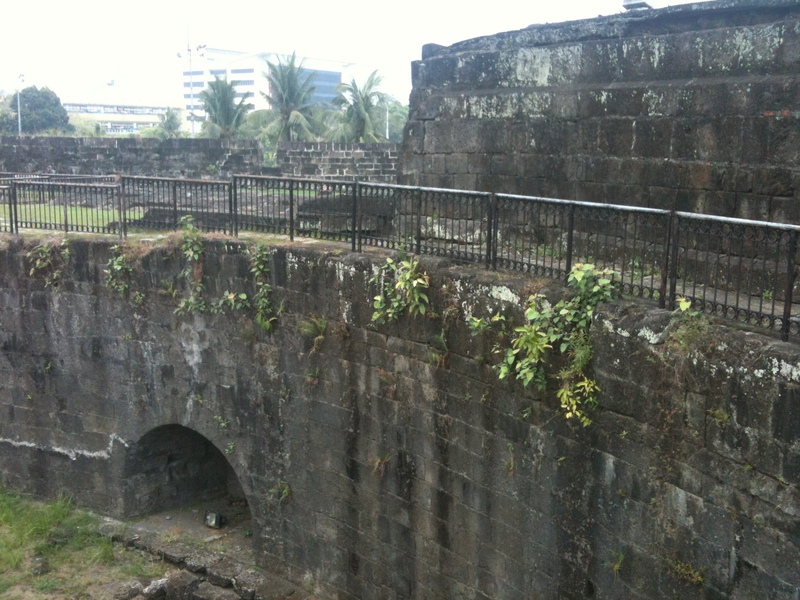 The site was excavated in 1980 and is now a major tourist attraction. 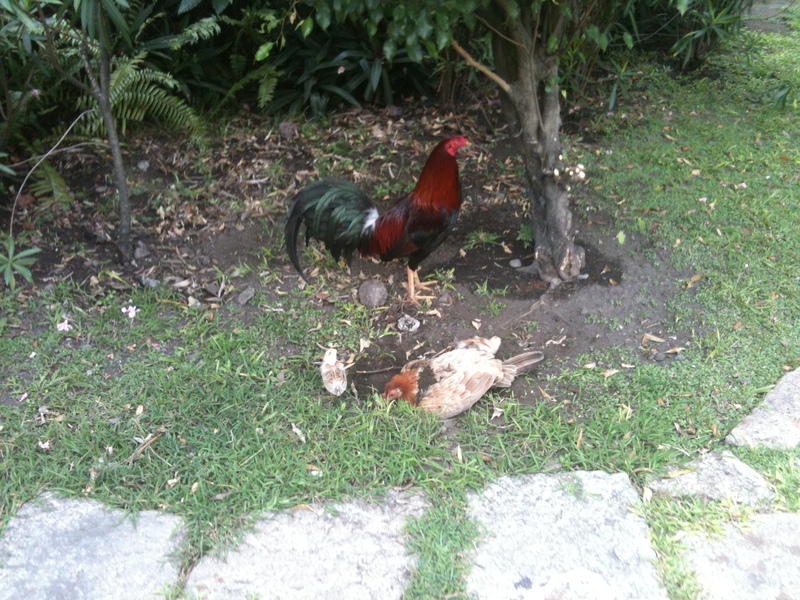 This family of chickens has made the fort thier home. They are probably unaware of its historical significance. 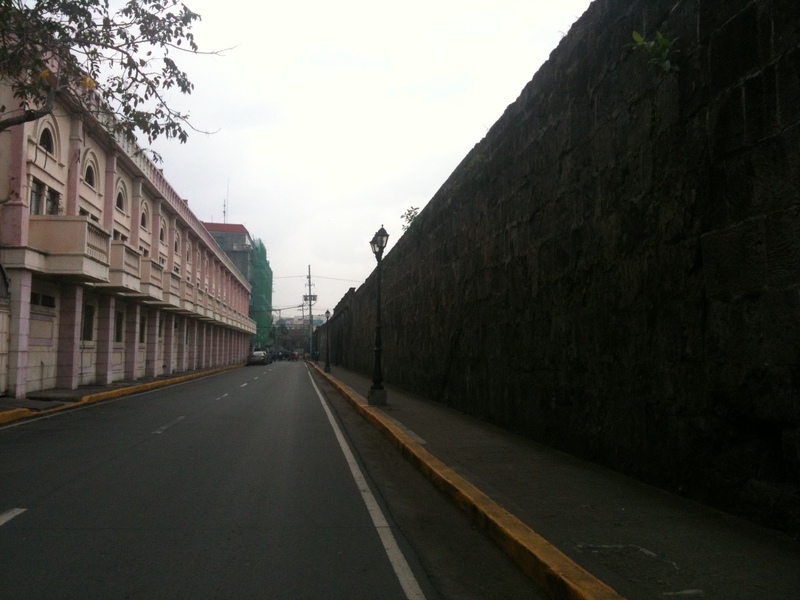 My death-defying bicycle tour of the city continued and I followed the wall through the busy streets visiting other points of interest along the way. 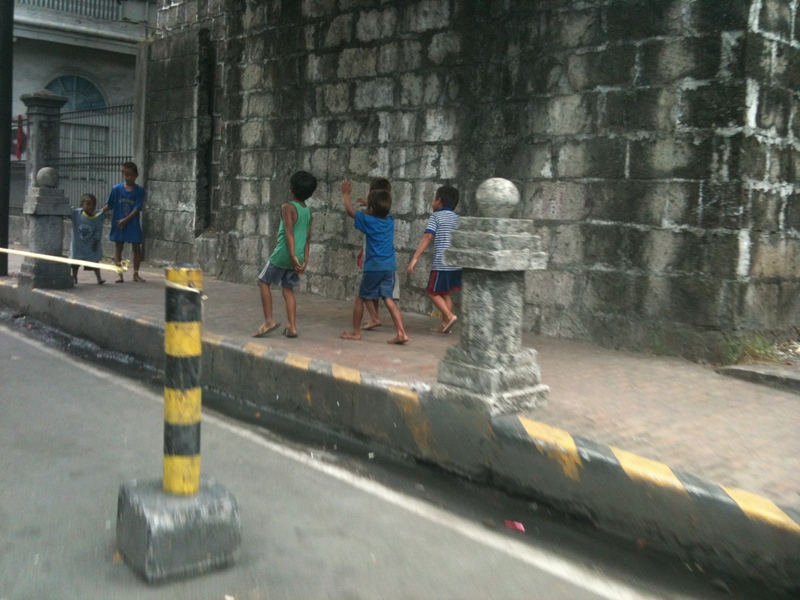 These children were playing alongside the wall, but probably should have been in school. 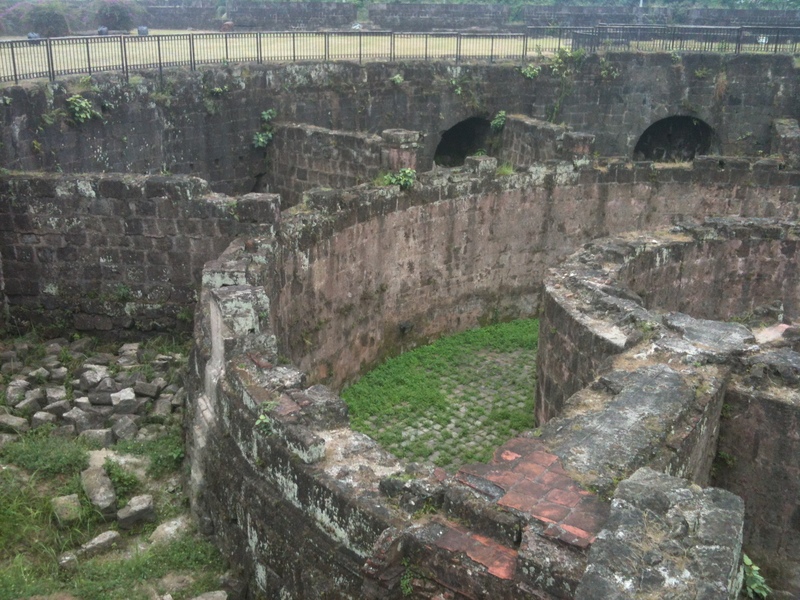 Further along the wall is another substantial fort – Baluarte de Dilao. 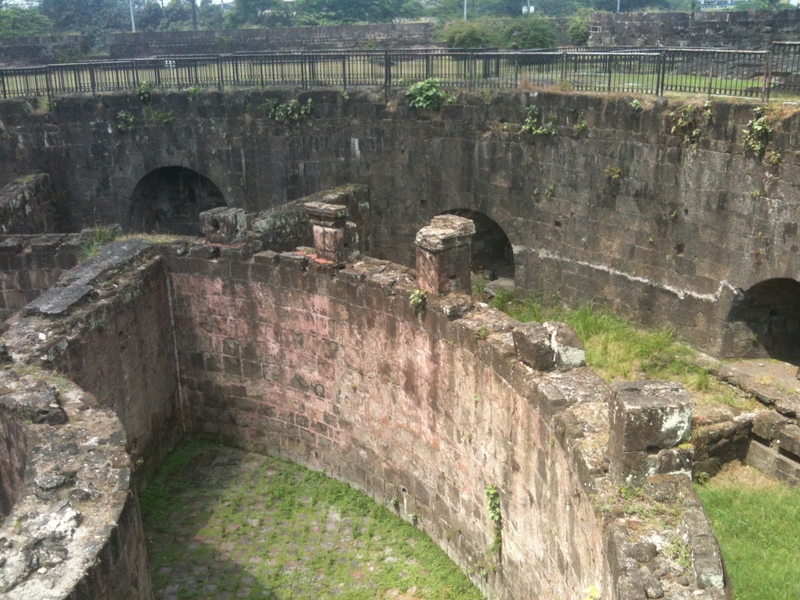 This fort is more modern and better preserved. 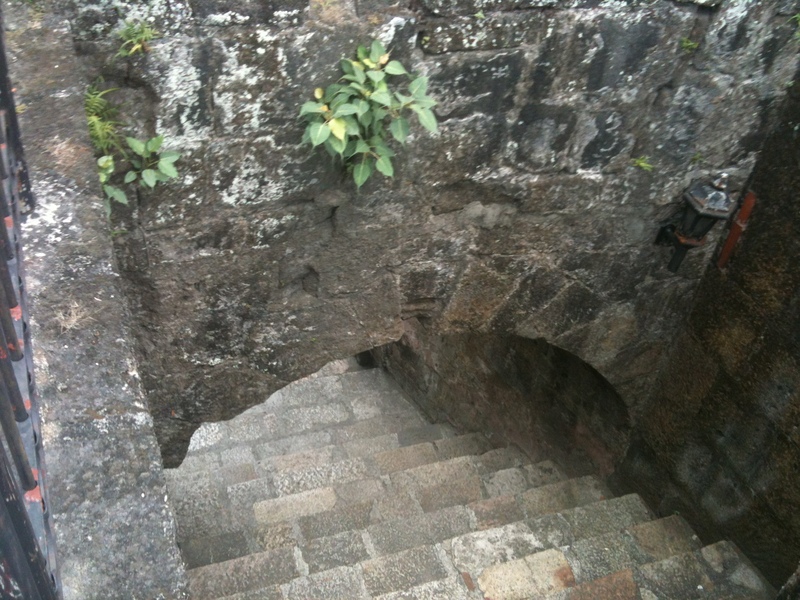 It was built in the 18th century to reinforce the city’s defences. 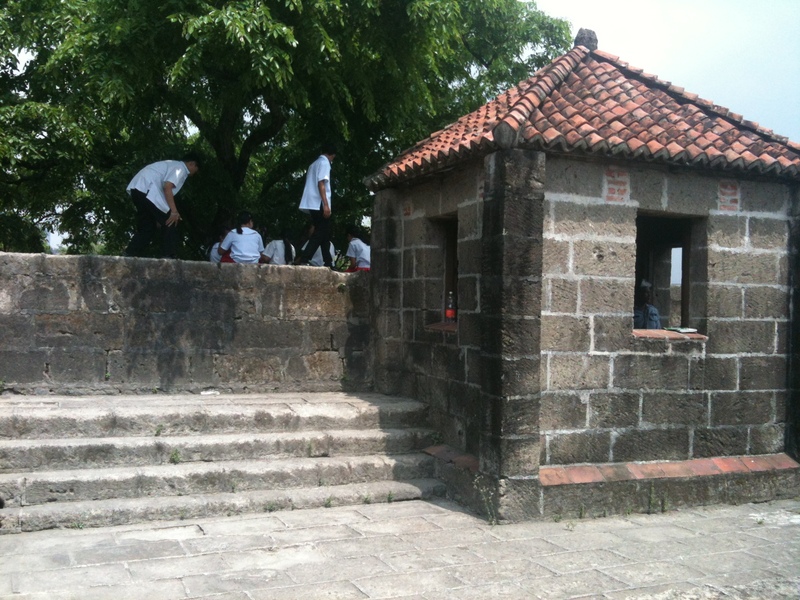 The day I visited, the site was overun with schoolchildren, eager to explore the nooks and crannies of the fort. 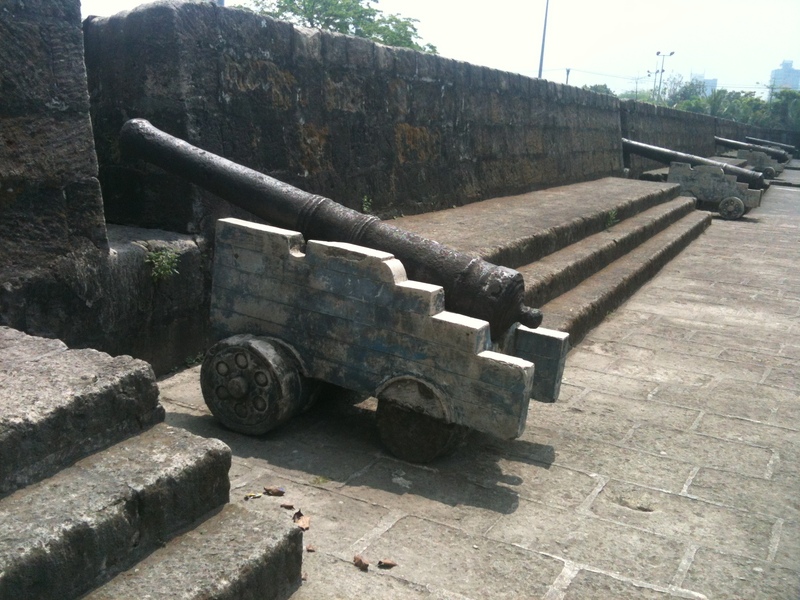 The fort was armed with dozens of canons, covering all of the approaches to the wall. 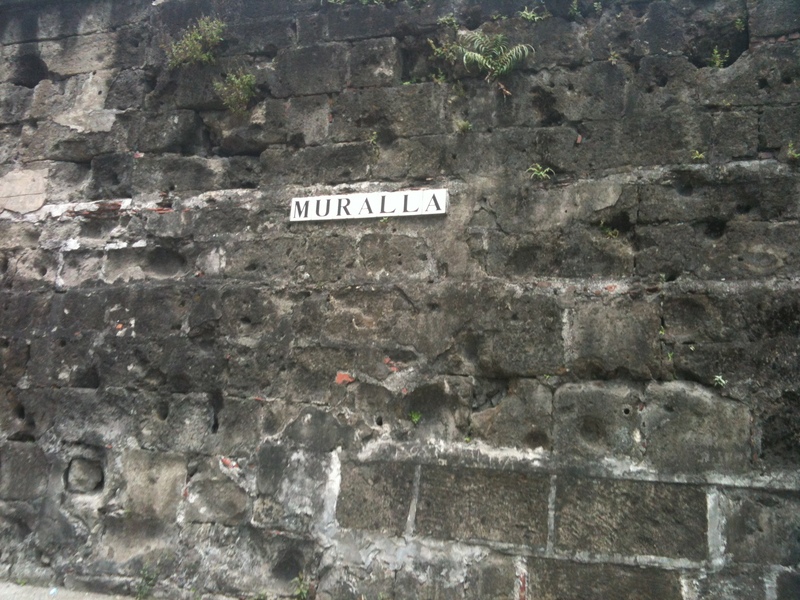 The Philippines was colonised by the Spanish in 1571, and while everyone seems to speak English now, Spanish continues to be spoken in parts of the country. 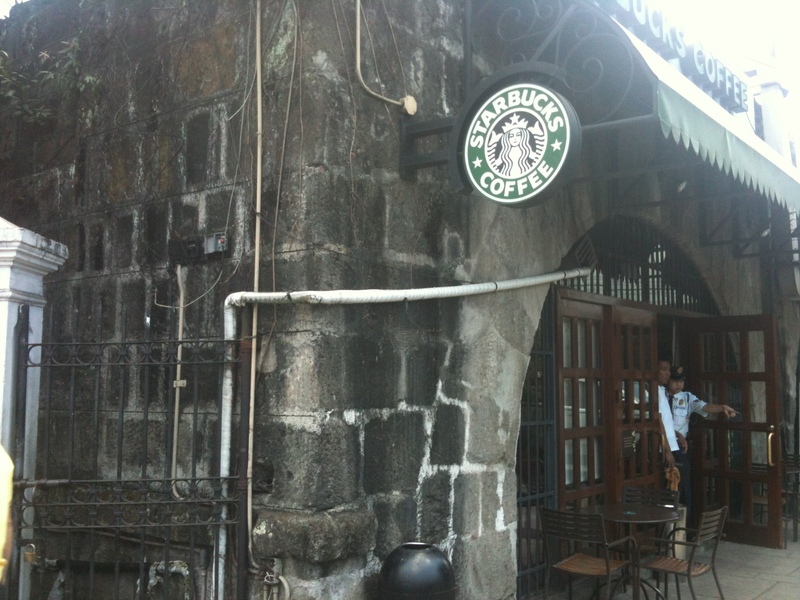 There is a Starbucks built right into the ancient wall. There is a guard with a revolver stationed permanently inside the store. 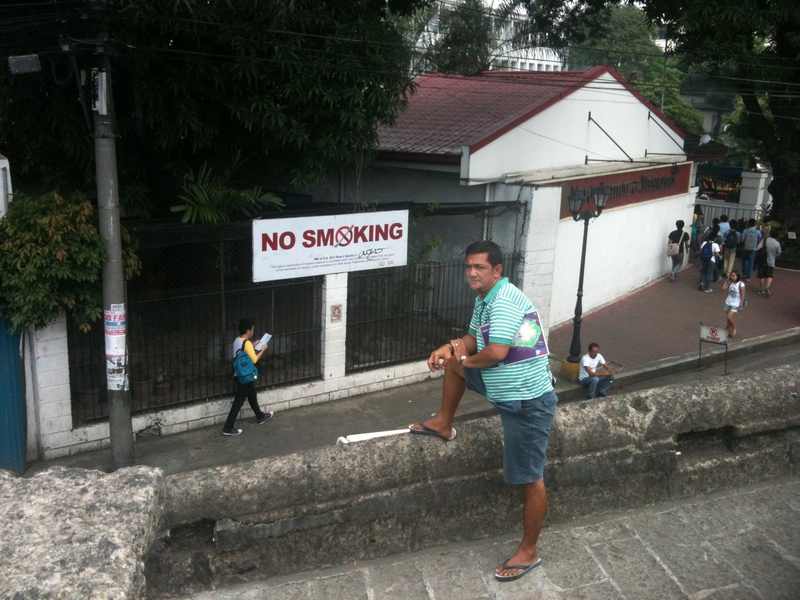 The guards in the Philippines all seem to wear very tight, well-fitted uniforms. They look very smart. But they’re only a bad moustache away from looking like they’re starring in a cheesy adult-entertainment film. 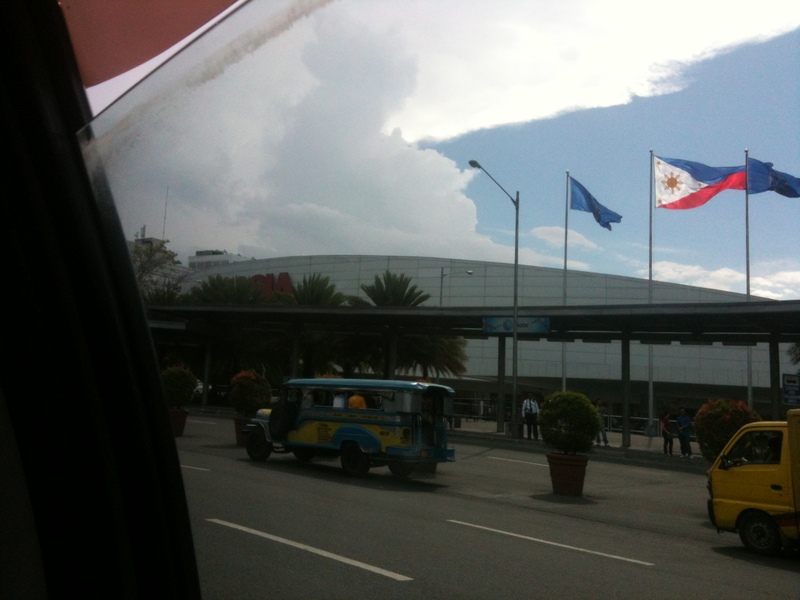 After Intramuros, I caught a taxi (one with an actual engine) out to the “Mall of Asia”. 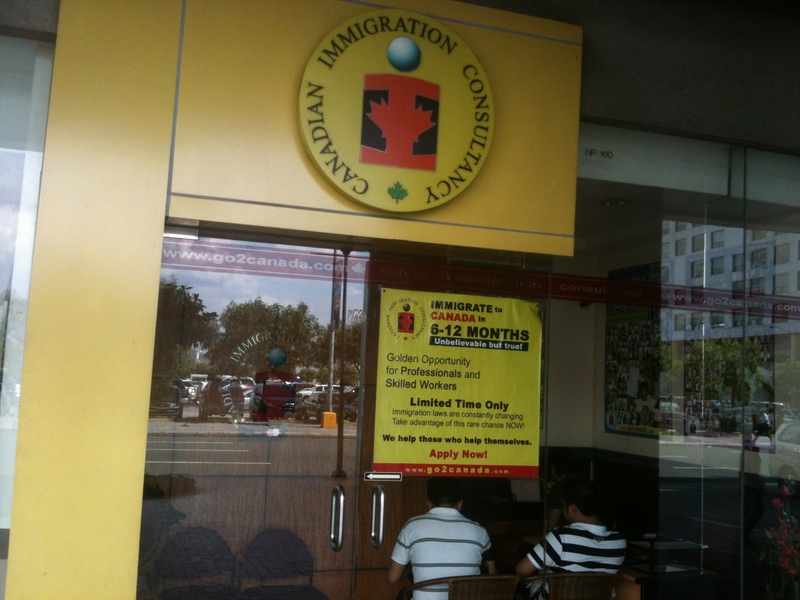 I came across this immigration service specifiically targeting Canada as a destination. I was curious so I asked inside where in Canada it’s easiest to go to. “Alberta and Ontario” was the answer. The Population of the Philippines in 98 million, so they can spare a few. 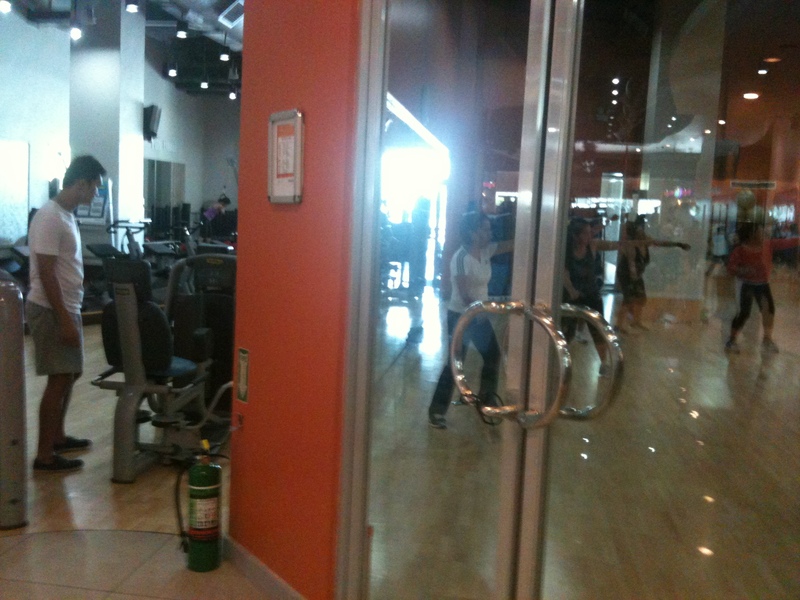 I also found a gym called “Fitness First” and paid 550 pesos ($13) for the daily admission. It is very well equipped and staffed by an army of personal trainers. There is a major fitness push going on in the Philippines at the monent. The gym was very clean and organised. I wish there was one like it in Port Moresby. 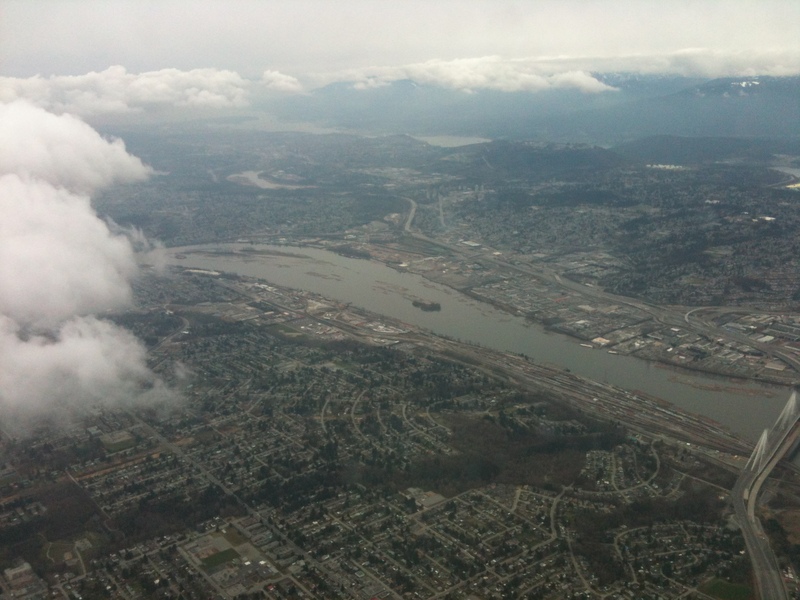 For the last couple of weeks, I have been enjoying a break in Canada. I’ve been snowboarding as much as I can, and running all kinds of errands, including shopping for the stuff that I can’t buy in PNG (or that is hideously expensive there). I have had a great time catching up with everyone in Canada and now the time is rapidly approaching for me to return to Papua New Guinea. I am looking forward to returning to the warmth and sunshine, but I have really enjoyed some time in the city that I call home.